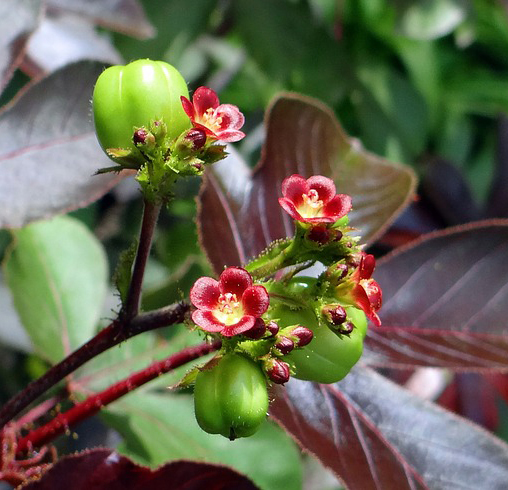 Bellyache bush (Jatropha gossypifolia) is an erect, highly toxic, annual woody tropical or sub-tropical perennial. 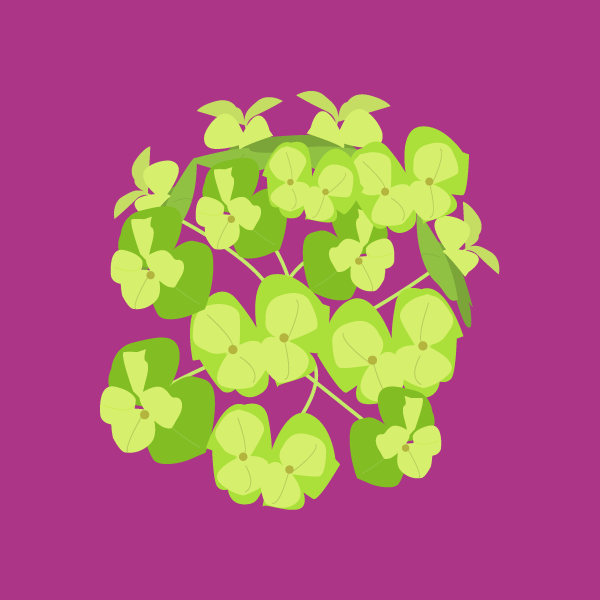 It is considered an invasive weed in many areas. 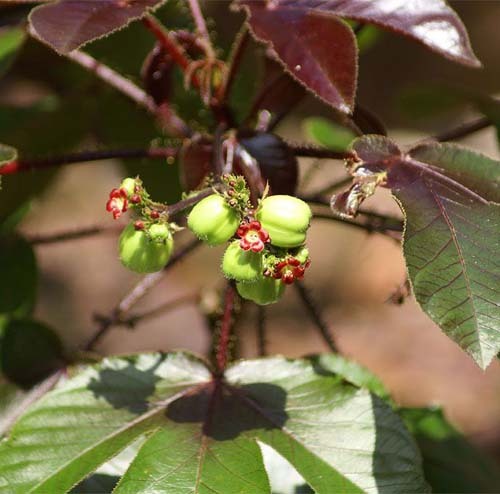 J. gossypifolia looks similar to the castor oil and physic nut plants. It has leaf stalks covered with coarse dark brown hairs and the young leaves are sticky. 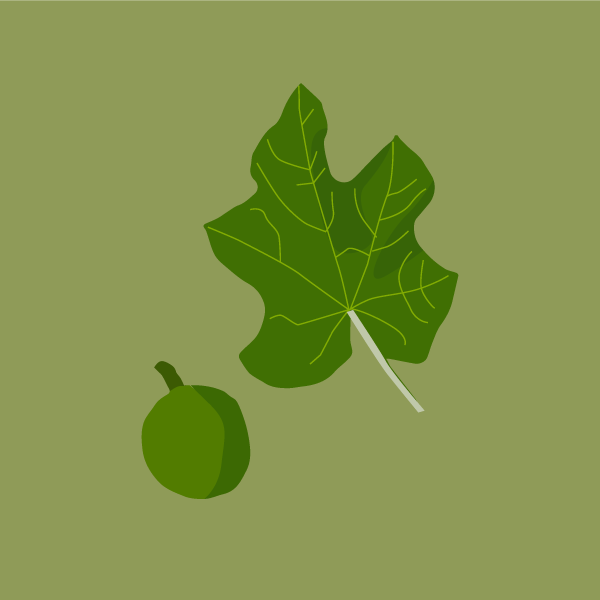 It produces purple flowers and capsular fruits which contain three tiny brown seeds. There is a large variation in flower color. Many cultures use parts of J. gossypifolia in medicinal attributes. 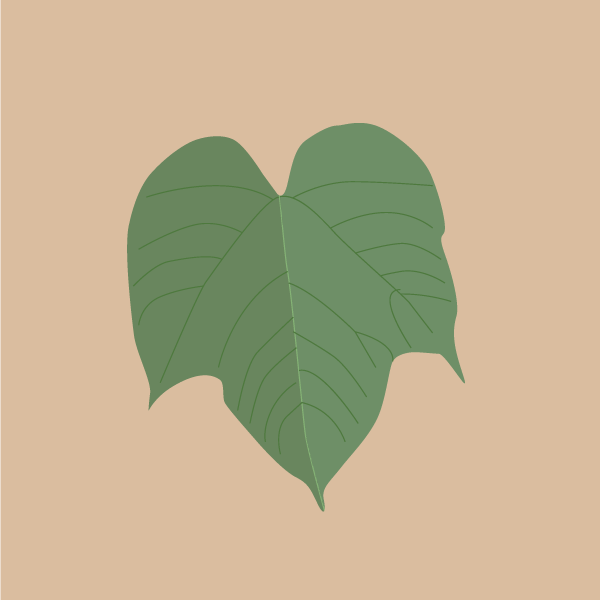 In Peru the leaves and latex are used to treat abscesses, tonsillitis, asthma, diarrhea, toothache, fever, gingivitis, fungal skin infections, inflammations, burns and coughs. The leaves are boiled up and used as a bath for fever and the leaves are used as a purgative in Jamaica. Roots of J. gossypifolia have been used for treatment of leprosy. Most parts of J. gossypifolia contain toxins of various concentrations; however the seeds are the most toxic. Ingestion of just one seed can be lethal to an average sized adult horse. The main toxins include purgative oil and curcin, which is found mainly in the seeds and also in the fruit and sap. 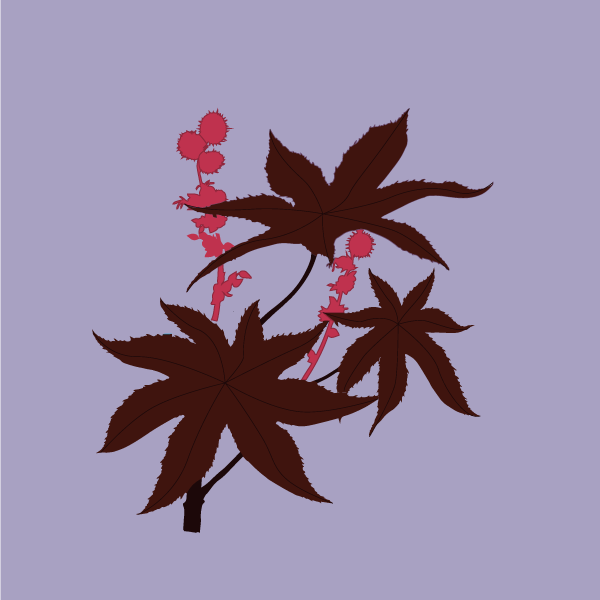 Curcin is similar to ricin, the toxic protein of castor oil plant (Ricinus communis). Once released, protein toxins (toxalbumins) inhibit the function of ribosomes, which are the subcellular organelle responsible for protein synthesis. Once the toxins are absorbed into the blood stream, rapid multi-system organ failure follows close behind. The latex sap from J. gossypiifolia can cause contact dermatitis. PHYSICAL CONTROL: Hand-pull entire plant, including the roots. Appropriately dispose of plants and other reproductive materials and wash hands thoroughly. FIRE CONTROL: High kill rates using fire have been achieved in the field if there is a sufficient fuel load to carry a fire through a bellyache bush infestation. BIOLOGICAL CONTROL: Repeated slashing of infested areas helps reduce density. CHEMICAL CONTROL: One biological control agent, the jewel bug Agonosoma trilineatum, was released for bellyache bush but it probably has not established. Investigations for new agents are being made. Bellyache bush Fact Sheet Queensland Government Department of Agriculture, Fisheries and Forestry. 2014. Pimentel LA, Riet-Correa B, Dantas AF, Medeiros RM, Riet-Correa F. Poisoning by Jatropha ribifolia in goats. Toxicon. 2012. 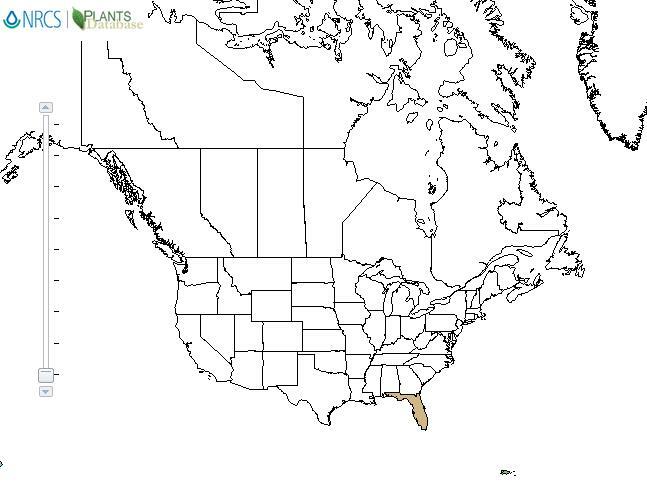 AlonsoAmelot, M. E.; Arellano, E.; Avila, J. L.; Aubert, L.; Romero, R.; Calcagno, M. P.; Avendaño, M.; Perez, M A survey of Venezuelan plants toxic to livestock and their potential as anti-insect materials. Acamovic T; Stewart CS; Pennycott TW (eds.) Poisonous plants and related toxins. CABI.. 2004. Oakes, A. J.; Butcher, J. O. 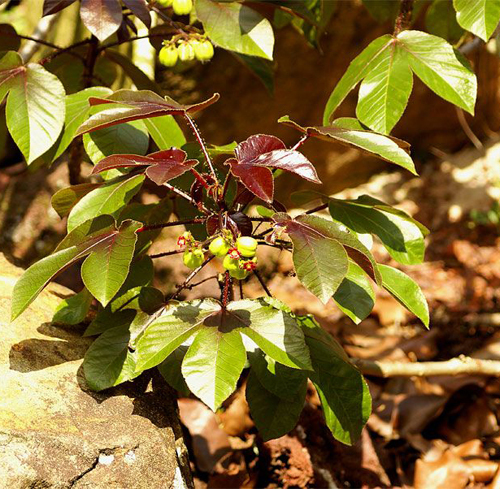 Poisonous and injurious plants of the U.S. Virgin Islands. U S Dep Agric Misc Publ, #882 97 pp. 1962.